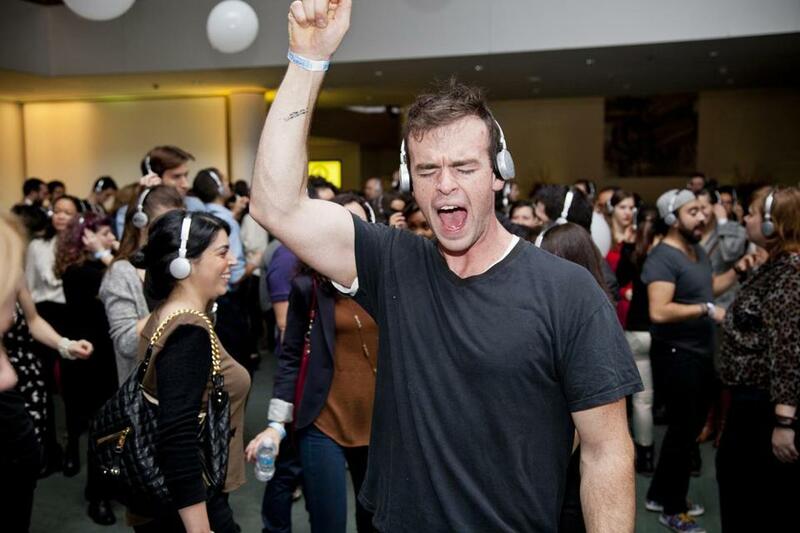 A “silent disco” event at New York’s Museum of Modern Art in 2012 had participants wear wireless sets from Party Headphones. As an undergraduate at Cornell University, Jake Reisch discovered two different business opportunities — one by crashing an outdoor party on the school’s arts quad, and one by dropping in unannounced at a retirement home not far from campus, and pitching his product to an octogenarian resident. In the four years since, Reisch has grown two “sister startups,” both of which market wireless headphone technology, but to two very different markets. Last week, his business, Headphone Events Inc., now based in Woburn, said it raised $3 million from a group of investors, its first significant infusion of capital. Plenty of business ideas, like Reisch’s, are born in college classrooms. But few of them make it to this stage. When they did some online research afterward, they noticed that silent disco seemed to have gotten pretty big in Europe, and they had a hunch it might soon take off in the United States, too. Because it’s so simple to set up a Web page and then get discovered by people searching for a particular topic, they did that, dubbing their nascent business Party Headphones. Not long after, someone planning a silent disco event at the Museum of Modern Art landed on the page and called them. One problem: They didn’t yet own any headphones. “I personally guaranteed a $25,000 line of credit from the Small Business Administration,” Reisch recalls, to purchase 500 pairs of headphones from a manufacturer. Reisch and cofounder Matt Reiners loaded them into the trunk of a Toyota Corolla and drove them to Manhattan. Later came events for clients like Twitter, Spotify, and Red Bull. With today’s version of the headphones, which the company has customized, you can tune in to one of three different channels — glowing red, green, or blue LED lights show which you’re listening to. You can change channels if you want to go dance with a different group, and DJs can see who’s listening to what they’re spinning. In 2016 alone, they’ve supported events for about 35,000 people, and, says LJ Berube, vice president of operations for Party Headphones, “We had events in Anchorage and Miami in the same weekend.” A set of 100 headphones, along with three transmitters that can beam music from different DJ stations, rents for $800 for a single-day event. But while renting headphones to party organizers wasn’t a terrible business to be in, it didn’t provide a consistent stream of revenue for the company. And silent disco certainly could wax and wane as a trend. “We were looking for an expansion market,” Reisch says. The possibilities included supplying headphones to international events that offered simultaneous translation; using them on noisy trade show floors; and deploying the headphones at retirement homes and senior centers. 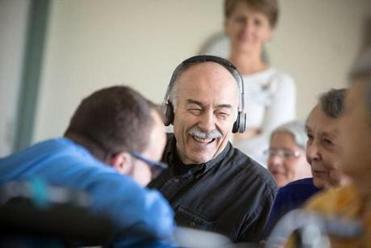 The company’s headphones for seniors have just one frequency and one light — a blue indicator that shows that the headphones are working properly. That initial cold call led to a deal with Kendal at Ithaca and a variation on the headphones’ design. These have just one frequency and one light — a blue indicator that shows that the headphones are working properly. There’s also a large volume control on one ear, designed to be easy to turn even with limited dexterity. They can be used in conjunction with different types of hearing aids, and the materials are antimicrobial. This second business under the Headphone Events umbrella is known as Eversound. It offers a set of 20 headphones for a $280 monthly fee, plus $300 for an initial setup. Eversound handles phone support, replacements when headphones break, and a monthly supply of fresh ear covers. “There are so many people working on apps for millennials and busy professionals,” Reisch says. “Older adults are a demographic that hasn’t been paid much attention to. At first, we were totally skeptical about why somebody else hadn’t done this. But people just hadn’t spent the time working with older adults and understanding their needs.” For him, that included staying overnight in several retirement communities. “Avoiding hotels was nice for a bootstrapping startup, but it was also so we could really learn from the customers,” he says. The two businesses now employ 12 people and share space in an office park in Woburn. The $3 million in new funding comes from Red Bear Angels; New Hampshire-based 10X Venture Partners; and The Shelter Group, a Baltimore-based operator of senior living facilities. While the Eversound headphones might start off in a single facility, Reisch says that in the best-case scenario, they spread from there to an entire chain; that’s the case with The Shelter Group, which owns 35 retirement communities on the east coast. That kind of empathy, and investment of time, can often be the difference between a good business plan and an enduring business.